Click/tap here to find the best Idaho fishing charter for your needs! IGS provides private, custom fishing adventures that are exclusive to your group. 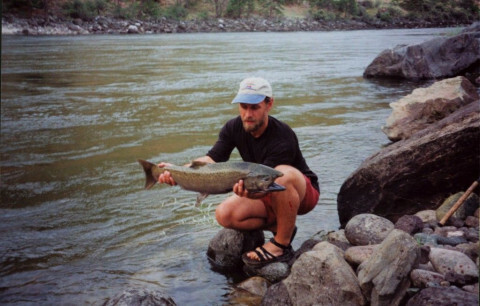 The Snake River offers an outstanding fishery for small mouth bass, trout and sturgeon in one of the most unique destinations in the northwest. You can expect to catch lot's of bass and multiple sturgeon in a day during prime months. White sturgeon are the largest freshwater fish in North America, weighing up to 400 pounds and measuring up to 12 feet in length, these prehistoric monsters may live for 100’s of years. Because Idaho's Snake River offers a catch and release fishery, there is an abundance of oversized sturgeon. WE use Rafts and Jet Boats to fish for these beasts..
Catching Steelhead is what we live for, let us bring you the dedication and quality you deserve and expect. Trips for both novice and experienced fishermen, customized to your needs and abilities. Let us help you hook into an Idaho Steelhead (ocean run Rainbow Trout) while taking in the wilderness setting of the Salmon River Canyon and it's wildlife. We strive to provide the highest quality Idaho steelhead fishing adventures available on the Salmon River. Our steelhead fishing guides are professional, experienced fisherman that will give you the best opportunity to safely hook into that Steelhead or Salmon you have always wanted. With many miles of Idaho's best steelhead fishing directly accessible from our headquarters in Riggins Idaho, we can offer the most avid sportsman the best in Idaho guided Steelhead fishing. All of our trips are guided in drift boats by knowledgable guides of not only the river but also the history surrounding this area and it's fish. A good lunch, quality rods and steelhead fishing equipment provided along with a propane heater for your comfort.